Watts Plumbing undertakes all aspects of plumbing, large and small, and regularly works hand in hand with architects, building contractors, engineers, project managers and interior designers. Operating in Cape Town and surrounding areas since 1999. 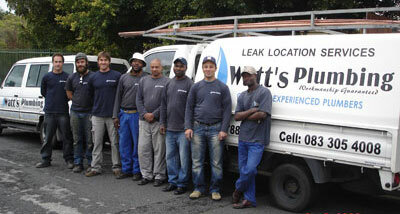 Founder and manager, Charles Watt, is a master plumber and highly skilled leak detector. We provide plumbing and leak detection services in most areas within Cape Town from Simon’s Town through to the CityBowl: Simon’s Town, Glencairn, ,Capri, Kommetjie, Noordhoek, Scarborough, Fish Hoek, Clovelly, Kalk Bay, St James, Muizenberg, Lakeside, Marina Da Gama, Tokai, Retreat, Kirstenhof, Bergvliet, Constantia, Diep River, Grassy Park, Plumstead, Rondebosch, Landsdowne, Claremont, Kenilworth, Newlands, Wynberg, Southfield, Rosebank, Observatory, Mowbray, Woodstock, Salt River, Oranjezicht, Tamboerskloof, Vredehoek, Bantry Bay, Camps Bay, Clifton, Fresnaye, Green Point, Hout Bay, Moullie Point, Sea Point. We are Health and Safety Compliant contractors. We have many contactable references, and can refer you to reputable professionals in the building industry to cover your other construction requirements. We can provide you with numerous contactable references from happy clients and business associates. Each of our highly skilled teams are honest, friendly and reliable, and most of our staff have been with us for many years. Our vehicles are boldly sign written and are easily recognizable for your security. We have tracking systems installed in all our vehicles, making it possible for us to pinpoint the movement of our vehicles at any given time.